These KiwiRail Train Wash Systems were provided to KiwiRail by Transport Wash Systems. We work with rail companies and their contractors in Australia and New Zealand to achieve the most efficient rail based wash systems possible. The systems we supply and support are designed and manufactured by InterClean Equipment and Tammermatic Oy who are the global benchmark in terms of reliability and efficiency of rail wash systems. 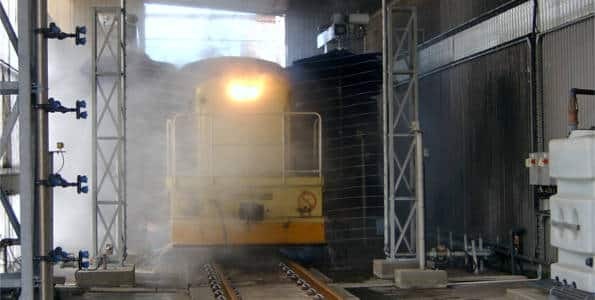 Save on health and safety risks to your employees, vehicle downtime, labour costs, water contamination issues and a heap of other potential problems – can you afford to ignore the benefits of automated train wash systems? Join Queensland Rail, KiwiRail and a raft of others in taking advantage of the speed, environmental management and safety that an automated train wash system offers.